Home Fitness OMG! Cycling, Atlanta style! I just … ugh. There’s so much wrong with that caption that to press “play” on the accompanying video felt sacrilegious, like I’d be offending my patron saints, Strunk and White. But because I’m an indoor-cycling instructor and have a weakness for time-wasting Internet videos, I clicked anyway. What I saw was a cycling class unlike any I’d ever attended, avoided, observed, or taught. 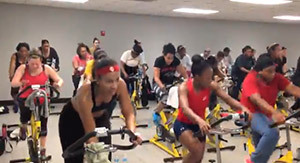 The students were on traditional stationary bikes, but as they pedaled to high-energy music, they were following instructor Keith Thompson’s lead and incorporating hip-hop dance moves into the routine. Thompson used to teach at a gym chain in Atlanta, and people would show up forty-five minutes early to get into his classes. So five years ago he founded his own business, KTX Fitness, which offers step, Zumba, and cycling classes at Adamsville Recreation Center, MLK Jr. Recreation Center, and Grant Park Recreation Center. Classes are $35 a month or $5 per class. Or, if you want a guaranteed seat, you can pay $10 per class. And a guaranteed seat is a must, as I soon learn when I show up to try Thompson’s most popular cycling class, the 10 a.m. on Saturday at Adamsville Rec. In the small studio, located behind the pools, every one of the twenty-five, low-tech bikes is accounted for and numerous hopeful students are turned away. One of Thompson’s regulars is kind enough to give me his spot. Though I’m a woman of words, I know I can’t do the class any justice. I can’t put into prose Thompson’s infectious energy, and the front-row riders whose legs flew while they dipped their shoulders side to side and swung their towels overhead. I’m unable to truly capture the friendly and non-competitive spirit of the people who took Thompson’s class. And I’m pretty sure I can’t adequately describe how awesome it was when two little kids got up in front of the class and danced while we worked out. So here is the resulting video* I put together—without the grammatically confounding caption. *special thanks to Crystal Furlonge for shooting this video on the fly.